The live instruments with compact portability for today’s young action groups! Today’s action groups swing to a modern sound with a driving beat. The FARFISA Compact Electronic Organs match the go-go tempo of their arrangements. 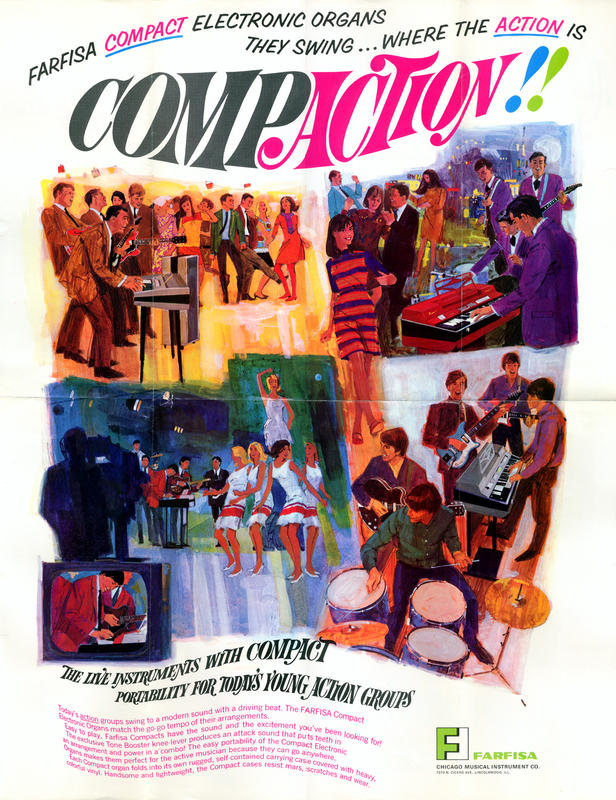 Easy to play, Farfisa Compacts have the sound and the excitement you’ve been looking for! The exclusive Tone Booster knee-lever produces an attack sound that puts teeth in an arrangement and power in a combo! The easy portability of the Compact Electronic Organs makes them perfect for the active musician because they can go anywhere. Each Compact organ folds into its own rugged, self-contained carrying case covered with heavy, colorful vinyl. Handsome and lightweight, the Compact cases resist mars, scratches and wear.